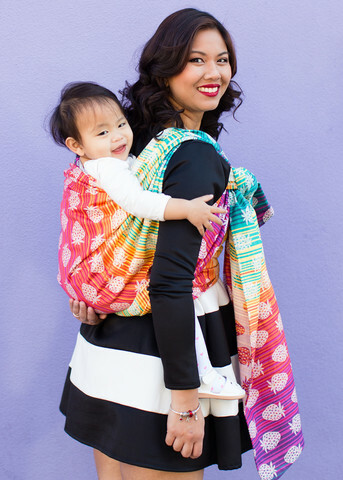 A burst of sweet color and a deliciously cute design is coming to our Tula woven wrap and ring sling line ups! 'Berry' Sweet is a playful design celebrating sweet things that we love. An adorable pattern of strawberries is placed upon an vibrant rainbow gradient background. 'Berry' Sweet is an all cotton medium weight (263 GSM in loomstate) woven that gorgeously flows as it softens each time that you carry your sweet little one. Fluid in hand, 'Berry' Sweet easily glides into place and has a snug support as your baby grows. Available in various sizes of woven wraps and ring slings, 'Berry' Sweet can be worn by variety of body types and comfortable support your baby. Let 'Berry' Sweet be the sweetest part of your day!